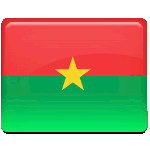 Britain, France and Germany were making numerous attempts to make the territory of present-day Burkina Faso their colony. Eventually Burkina Faso became a French colony in 1896. French language was imposed in the colony, and the leading positions were occupied by French. In 1919 France separated the present-day territory of Burkina Faso from Upper Senegal and Niger to bolster administration and prevent armed uprising, thus the Upper Volta was established. It preserved this name till 1984. In 1932 the colony was dismantled and its territory was divided among French Sudan, Ivory Coast and Niger. The changes were reversed in 1947 due to intense anti-colonial agitation after the end of World War II. The colony of Upper Volta again came to existence on September 4, 1947 as a part of the French Union. The Republic of Upper Volta was declared in 1958 and the colony achieved the status of a self-governing territory. Upper Volta received full independence from France on August 5, 1960.